Two out of three people proceed with new lock installation to avoid invasions. It's natural! The main concern of all homeowners is to keep intruders literally locked out of their doors but at second thought, it won't be bad if they wouldn't approach your house at all. In most occasions, perpetrators have good reasons for choosing certain houses as targets instead of other ones and these factors must be taken into consideration. You must not give them the satisfaction of considering your house an easy target but quite the opposite… You must drive them away. Take a moment to ponder on how the perpetrators would think, so you would know how to keep them out of your property. They definitely want to work in the dark. They prefer houses with easy security door locks and hidden corners. Although a well-secured house might give the impression that there are valuables inside and, thus, it is worth taking the risks, they rarely do. 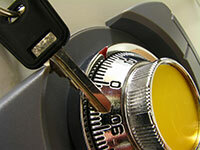 Even if they will, they will come across some complex alarm systems and door locks and soon will be discouraged. Deadbolt installation is a must. Additional security systems are also a must. I f you have a tall fence around the house, which might conceal their actions, it's even more necessary to have loud sirens and motion detectors. Light up the whole yard! They hate working in the light since there is a high chance that someone might see them even from the windows of the houses across the street. Trim all trees and bushes so that they won't have a single place to really hide. Install cameras, which can follow their actions. They will definitely be discouraged by those. Make sure all tech equipment works with backup batteries as well in case there is a power failure or they cut the power themselves. All entrances must have good locks and must remain locked. Have the locks replaced occasionally and repaired even if problems are minor.